These are elements which function to connect to structural walls separated by a vertical movement joint. They are made from stainless steel that have one end covered by a plastic sleeve to prevent adhesion to the mortar. This has a clearance of approximately 1cm to allow free movement along the horizontal plane of the wall. With structures that have ceramic or concrete blocks that have thicknesses greater than 14cm, layout is recommended in pairs, two units in each joint not exceeding the maximum vertical distance of 60cm. 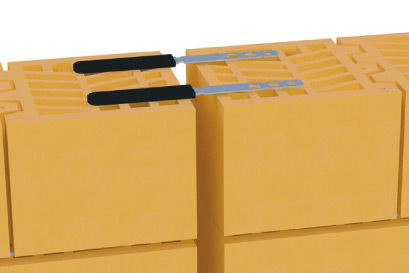 In structures where the bricks are more than 12cm it is recommended that the keys in the joints do not exceed the minimum distance of 50cm apart vertically. The metal plate will be introduced into the sleeve until the slit on the plate is on the brink of the plastic sleeve. This ensures proper functioning of the key no matter what time of the year when building the structure. The plastic sleeve and metal plate should be seen in the movement joint. 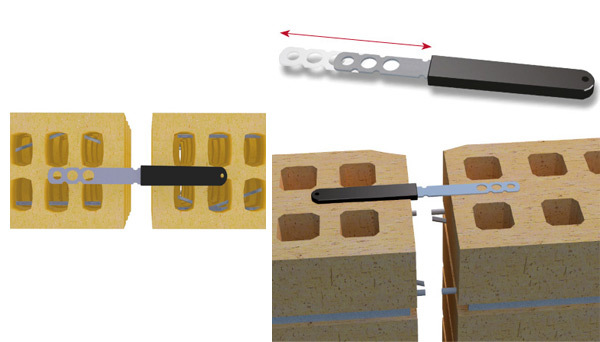 It is absolutely essential to stop the continuity of the fisufor®/geofor® bed joint reinforcement (cut the reinforcement to pass through a movement joint).